Facing challenge isn′t a problem. It′s an opportunity. Today, challenge is a constant feature of the workplace, and a manager′s ability to respond to challenge can spell the difference between success and failure. Research at The Center for Creative Leadership (CCL) has shown that successful managers learn many of the skills that contribute to their success from their work assignments. The Job Challenge Profile (JPC) created at CCL by some of the top practitioners in the field is a self assessment questionnaire designed to help you better understand and use your job assignments as opportunities for learning and growth. 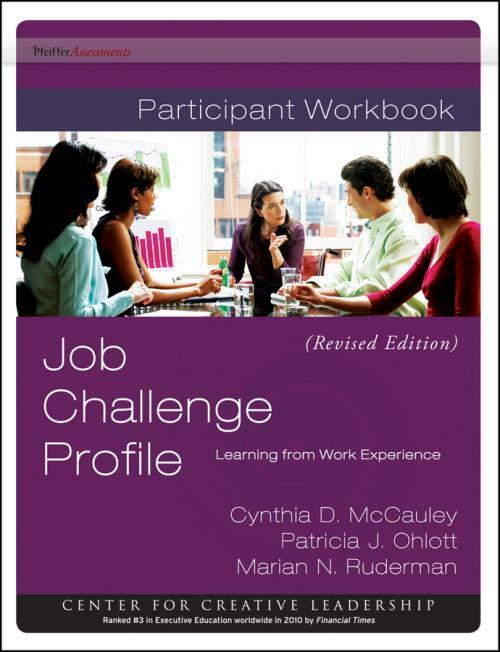 This newly revised and updated workbook will help you interpret your scores on the Job Challenge Profile, focus on the learning potential of your current job, and use job assignments for your ongoing development. Managing group diversity . . . and much more! You′ll quickly be able to score and interpret the inventory using this practical Participant Workbook. With the aid of this action guide, you′ll determine what and how much you are learning, what parts of your job hold key challenges, and what strategies you might adopt to derive maximal learning from these experiences. With the assistance of a world–renowned leadership authority, you′ll thrive on challenge and greatly enhance your job satisfaction! Section I: Scoring the Job Challenge Profile. Section II: Capitalizing on the Learning Potential of Your Job. Section III: Using Job Assignments for Ongoing Development.